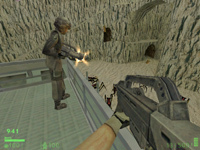 Here are some pics from the Half-Life game Mod. Some very talented floks are working on some cool custom bug hunts! 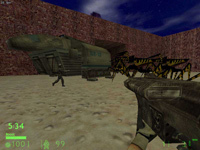 The Starship Troopers Modification is based on the engine of the award winning game, Half-Life. Although being called a MOD, it will probably be a Total-Conversion, using no elements from the original game. 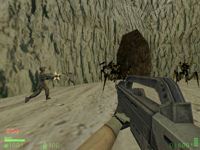 SSTMOD is a cooperative based multiplayer game, where Human players will join a server to fight against hordes of Arachnids and other nasties, in many different scenarios. The game will focus highly on level of teamwork and such, because it is incredibly hard to stay alive by yourself. The Arachnids of Klendathu have destroyed a major city on Earth and it is our job to fight back. 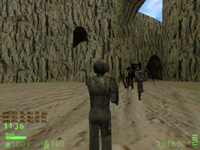 You take the role as a Mobile infantry officer who is sent to one of the bug planets to destroy the Arachnid race. There will be many different scenarios, depending on the maps. Search and Retrieval: This is the type of maps that were featured in the movie, where you have to make it to a certain point, and scout the area or collect data and then wait for a retriveal boat. Circumstances of surrounding area is usually unkown and most missions take place in high-risk areas. Locate Brainbug: These maps will all take place in an underground situation, going deep into the bugholes to locate what the scientists call a Brainbug, a mother of all the warriors and workers who can control them with her mind. If captured, we would be able to learn much about their species and possibly find new ways to kill them. Airstrike: A unit is sent to find large areas where bugs are found and call in an airstrike without being seen. Then the unit must go in and clean up any remaining living arachnids and clear out remaining bugholes, so that an outpost can be set up. TeamTag Training: Takes place back at the base, the only type of gameplay that involves humans vs humans, in a lasertag game of capture the flag. Other scenarios will be possible, it all depends on what kind of maps are created and then what is coded in. Standard Infantry: Comes with the Morita Smartrifle MK1, with shotgun attachment, as its standard weapon. Good armor, good speed, and is prepared to die. Also equipped with either Claymore mines or Grenades. Plasma Infantry: Instead of the Morita Smartrifle MK1, he is equipped with the Assault Plasma Cannon. Same attributes of the Standard Infantry, and can choose between grenades or claymore mines as well. Rocket Infantry: Comes with the Tactical Rocket Launcher, capable of firing 15 Normal and Homing rockets, or 2 Tactical Nuclear Missiles. Comes with the Morita Fleet Carbine, a smaller version of the MK1, OR can come with the Fleet Plasma, a smaller version of the Assault Plasma Rifle. Medium Armor to move the Rockets around quickly. Flame Class: Comes with the FlameThrower and 2 Napalm Grenades, and is the slowest class in the army. No Fleet weapon is available for this class. Heavy Armor, since most fights are close ranged. Communications: This class is Needed for airstrikes and retriveal purposes. Only person certified to use radio equipment and can detect sounds from far away, a type of bug radar. Comes with Fleet Carbine or Fleet Plasma, and 2 Grenades. Recon: Fastest of all classes, and has very little armor and only carries Fleet Carbine and a Radio. But special feature is he can move past small groups of bugs, somewhat undetected, to scout the area out. Warrior: Meanest of them all, has no fear of death or pain, and will continue to attack until its dead or your dead. Extremely fast and Extremely deadly, and you usually won't find them alone. Hopper: Hides in the mountains until the perfect time to attack. Swoops down with incredible speed and unless your ducking, expect a pretty close haircut. Brainbug: Not much is known, other than this bug might control all the bugs on its planet, a "mother" species. Chariot: The bug that carries around the brain bug, attacks are weak but they are tough to kill. Tanker: POSSIBLY BETA1, not sure. Forum is moving... stay tuned for new addy.